My mom, staunch Buddhist, was trying to get my brother to do the new year countdown at the temple of all places. Bro: Who goes to a Buddhist temple for countdown anyway? Kenny: Yeah, it's gonna be like "THREE! TWO! ONE!... Nahhhhh mohhhhh ohhh niiii"
Here's wishing you a Happy New Year, from all of us at the staff and production crew at kennysia.com. Wishing everyone a very happy year 2008! And, I am getting married this saturday! HaHaHa. Happy New Year Kenny! i love ur post vy much kenny!! Happy ny 2008 everyone, all the way from Sri Lanka.. just now it was like war out there when approaching 12am here.. fire crackers everywhere.. kinda annoying.. durr~~ kacau me sleep nia..
7 hours more to a New Year here in Toronto but HAPPY NEW YEAR 2008!!! Oh.. Kenny..!! yer just too funny..!! Happy New Year to you and yours..! Happy New Year to everyone. Peace on earth and hopefully no recession in 2008. Happy New Year to Kennysia.com's one and only production crew! 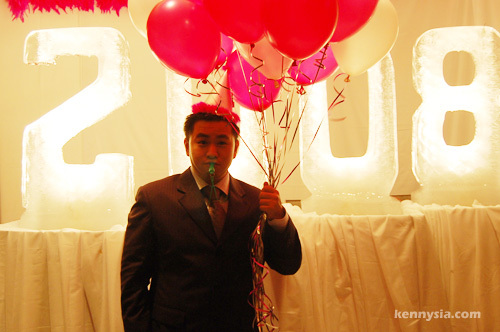 Lol you look so cute Kenny! Happy New Year to You, funny man. And to the rest of the readers, Have a Great Year Ahead. The entire staff indeed. Haha All the best in 2008! haha! so cute! happy new year! This is your cutest photo ever on ur blog. Happy New Year and a toast to you for a fantaasstic year ahead! Happy New Year..have a good 2008!! HAPPY NEW YEAR 2008 TO YOU & ALL IN THE FAMILY !! happy new year kenny! i love reading ur blog! happy new year! best wishes on whatever you're gonna do this year. Happy brand New year, kenny!! Happy New Year Kenny~! Muackz~!! *tee hee* And you look really cute in that photo! Looks like you have a lot of fun. Hi Kenny. Happy new year. :) Buddha bless you for the year ahead. Yeah saw u in Hilton's Senso last nite, and also at the Bing on christmas night too. So what's the Kylie's night in the ballroom about? anyway Happy New Year to all of you ! err you look "cute" in this pic! Keep up the good work ya! Happy New Year and may all be blessed with happiness, wealth and health. HAPPY NEW YEAR TO EVERYONE WORKING SO HARD FOR KENNYSIA.COM!!! i don't intent to make any comment, but since i read ur short talk....ok, I did went to a Thai Buddhist Temple at Jubakar, Pengkalan Kubur, Kelantan for d countdown. Outside they have live band singging from Thailand.. was great as the youngster were happily..singging Loso's song. And inside the temple, the monk chanting until 12 midnight, then they hit the big chime/bell for afew times followed by fire crackers and fireworks.. HAPPY NEW YEAR TO U & UR FAMILY! Haha...thought your blog hired some crew oredi.. Anyway, wish you a happy 2008 new year.. and hope this coming year will see the more exciting next level kind of kenny sia...CHEERS!! lol wtf entire staff and production crew lol. HAHAHAHHA I LOVE YOU KENNY! Happy New Year to you Kenny! May God continue to shower you & your family with many blessings of health and wealth in abundance! Let the Year 2008 be a year of prosperity for you too! wow,that's a lot of people. Happy New Year Kenny. Looking forward to more exciting posts this year. happy new year! i made a resolution last year to post a comment on EVERY entry of kennysia.com. I didnt achieve it but i'm near! very very near! Happy New Year,Kenny. May you have a fruitful year ahead. Stay happy, stay healthy and stay cool always! p/s: Your picture look so cute! Happy new year kenny! i thought u expand your 'business' until u got supporting staff already! hiak hiak! thanks for another year of great blogs. may you get more sponsored travel trips and events! is that an ice sculpture? Kenny Happy New Year 2008 and Hope there will be many many happy returns. Hahaha, that's my type of humour! Happy New Year! That's Kenny, the CEO. That's Kenny, the Manager. That's Kenny, the Receptionist and that's Kenny, the kopi soh. Haha..Happy New Year Kenny, may you hav a greater year ahead. New Proton Saga Pricelist and Specs found on the net for those interested. Haha.. Nice One. Happy New Year, one and only kennysia's crew. Happy New Year Kenny, and Happy Birthday Kennysia.com.